Hand harvested grapes — 100 % destemmed. Fermented in one Rousseau 2 ton French oak open top fermenter and T-Bins. Cap manually punched down twice a day during fermentation. 3 days cold soak and 21 days total average cuvaison. Aged an average of 20 months in French oak barrels: 33% new oak from Tonnellerie Rousseau. Bottled unfined and unfiltered on June 2nd of 2009. Bottle aged 5 months. Released on October 25th of 2009. 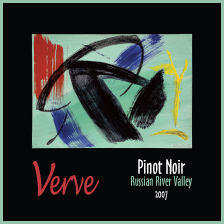 This single vineyard version of our Russian River Valley Pinot Noir comes from one of our favorite vineyards of that appellation, Emeritus Vineyard, which is located west of Sebastopol, and was planted 8 years ago with clones 777 and Cruz. This site has given us a wine that combines the deep, dark, voluptuous cherry we expect out of the Russian River Valley with complex under-pinnings of mineral-laced earthiness. Broad but not hard in the palate, the wine mingles Bing cherry, brown sugar and spice from Rousseau barrels, and that hint of graphite which makes us sure this wine is only going to get better and better over time.